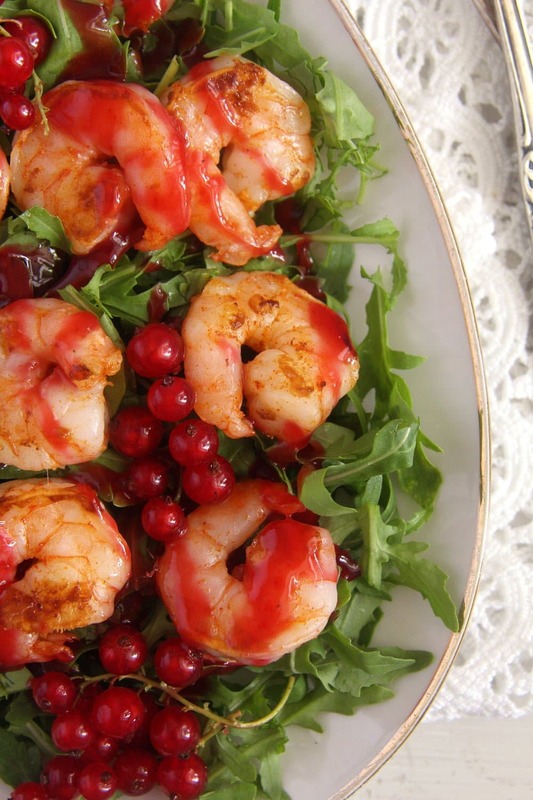 A wonderful light meal: tiger prawns with red currant sauce on a bed of rocket. This is one of the best meals I had in the last weeks I think. I decided to make this mostly to be able to use some of the millions of red currants my friends seems to have in her garden this summer and because I wanted to make something a bit unusual. 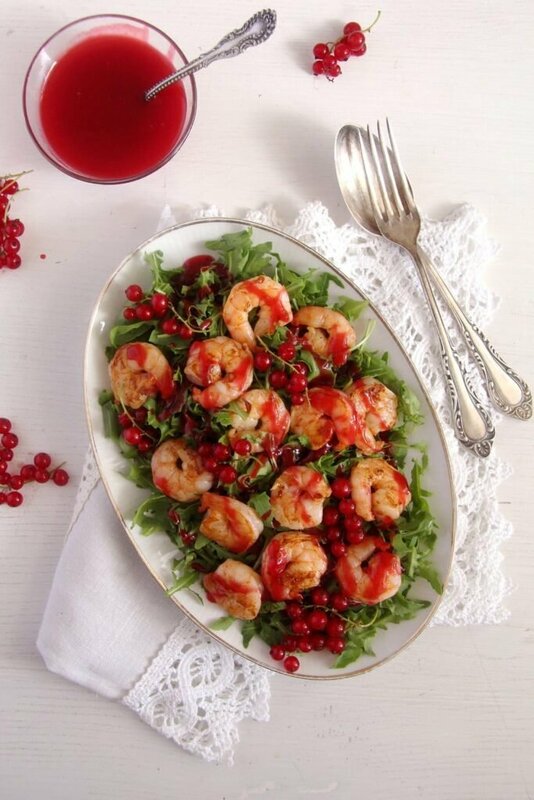 A spicy red currant sauce that complements the tenderness of the prawns and the pepperness of the rocket perfectly. I absolutely loved the prawns, I could eat them cooked this way every day, but the sauce is what made this recipe special. Sour, hot, sweet – all in one – and that poured over that peppery rocket – heaven! So although I made the sauce especially for this particular dish, I used the rest of it to dress a couple of salads over the next few days, so I can say that this sauce, cold, makes a wonderful dressing as well. This was also a good opportunity to use some of my Homemade Crème de Cassis or Black Currant Liquor. I like to give a few tablespoons of it in some sauces, it adds a particular note to everything. 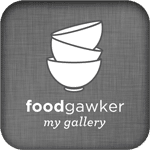 So, if you have it, I can strongly recommend it, if not, than either leave it out or replace it with another fruit liquor that you like or even some brandy. The recipe is supposed to serve 4. My husband and I had absolutely no difficulties in managing the whole thing alone. Place the clean prawns in a bowl, add 1 tablespoon of the olive oil, paprika and some salt. 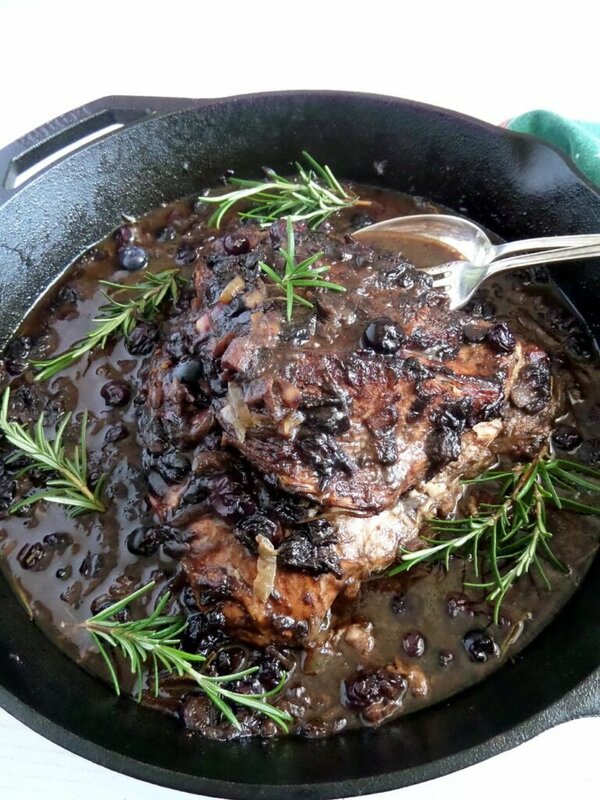 Mix well with your hands and set aside until you are almost finished with the sauce. Chop the shallot very finely. Remove the stems from the red currants. Deseed (or not) the red chili and chop it very finely. Heat the second tablespoon olive oil in a small saucepan. Cook the shallot on medium heat until translucent. Add the red currants, chili, sugar, 3 tablespoons water and some salt. Bring to a boil, lower the heat and simmer for about 5 minutes. Pass the mixture through a sieve to remove the seeds of the currants and give the sauce back to the pan. In a small bowl mix the cornstarch with very little water to form a paste. Bring the sauce back to boil and slowly whisk in the cornstarch mixture. Cook for another minute, then stir in the cassis liquor and the honey. While the sauce is cooking, wash and dry the rocket and arrange it on two to four plates or on a large platter. Heat a large non-sick pan on medium heat. Add the prawns and cook 1 to 2 minutes on each side. Do not overcook. 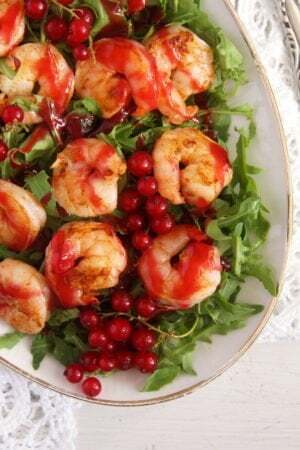 Place the prawns on top of the rocket and pour some of the red currant sauce all over. Serve immediately with the remaining sauce and baguette. oh my gosh…I love tiger prawns and the sauce looks pretty amazing too !!! I’ve never had it with redcurrant sauce before! Wow look at those juicy prawns. 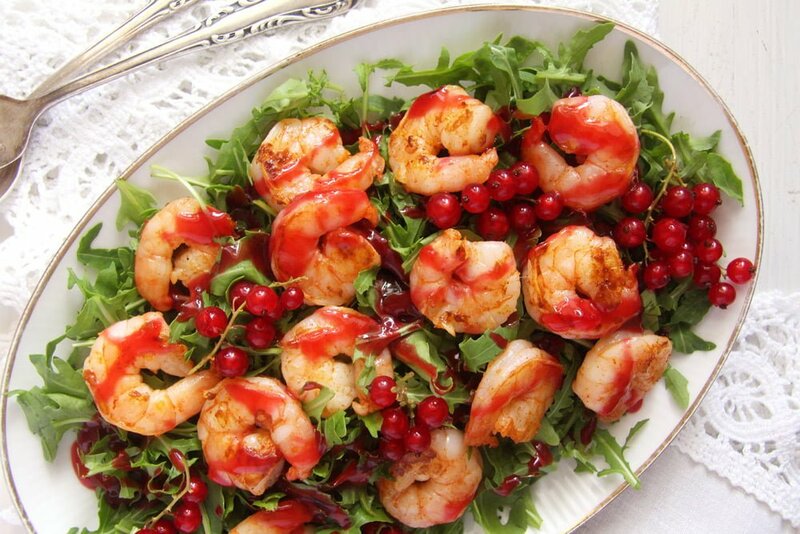 My kind of salad…those prawns are really succulent and delicious. This sounds like such a lovely combination! How lucky to have a surplus of red currants! Love that you’ve used them with these prawns. The color is spectacular.